Cogent Strategic Wealth is an investment advisory firm registered with the United States Securities and Exchange Commission under the Investment Advisers Act of 1940. 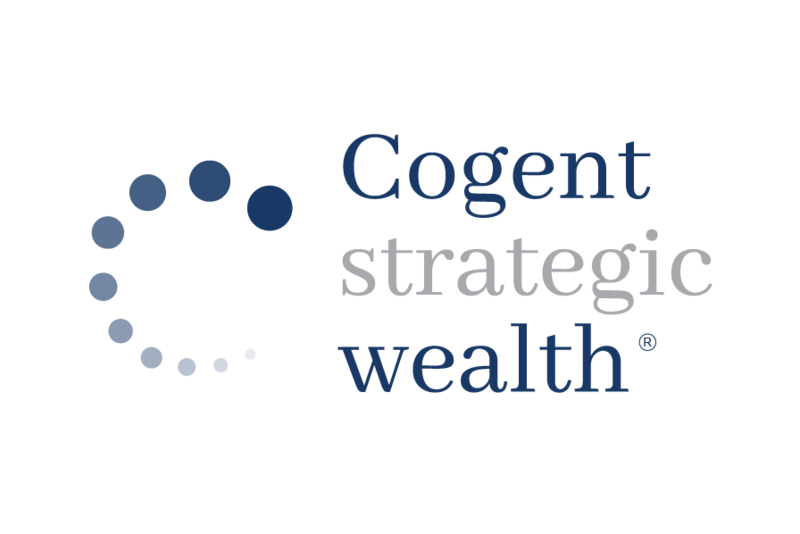 Cogent Strategic Wealth provides individual client services only in states in which it is filed or where an exemption or exclusion from such filing exists. Registration as an Investment Advisor does not imply a certain level of skill or training. This site is for general information purposes only and is not intended to provide you with any personalized financial, insurance, legal, accounting, tax or other professional advice. You will not rely on this site as a substitute for independent research or for personal advice. Proprietary papers and writings are the opinions of Cogent Strategic Wealth. Other articles, links, and information presented on this site are obtained from sources believed to be reliable, but they are for informational purposes only and Cogent Strategic Wealth does not guarantee their timeliness or accuracy. You acknowledge that Cogent Strategic Wealth collects and uses personal information for purposes of providing the services described on this site. Cogent Strategic Wealth is committed to respecting the privacy and confidentiality of information in accordance with applicable law. Cogent Strategic Wealth has established and will continue to maintain appropriate safeguards to protect the security and confidentiality of personal information. However, you acknowledge and confirm that the Internet is not a secure medium where privacy and confidentiality can be guaranteed and that complete security and confidentiality of transmissions to and from this site over the Internet is not possible at this time. Your confidential use of the site cannot be guaranteed and you acknowledge that your use of the site (including information you transmit to the site) may be subject to access or manipulation by, or disclosure to, third parties. Without limiting any other disclaimer herein, neither Cogent Strategic Wealth nor any third party shall be responsible or liable for any damages that you or any other person may suffer in connection with any such breach of privacy, confidentiality or security. If you are provided with a user name and password to access any part of this site, you agree to be liable for all uses of your user name and password, including unauthorized use without your consent and you acknowledge that Cogent Strategic Wealth shall not be responsible to confirm the actual identity or authority of any user. Instructions provided pursuant to such user name and password shall constitute sufficient authority to Cogent Strategic Wealth to execute any transactions directed there under. You agree to notify Cogent Strategic Wealth immediately should the confidentiality of your user name and password be in jeopardy. The security of e-mail communication cannot be guaranteed at this time. Any person wishing to communicate or send information of a private or confidential nature to Cogent Strategic Wealth is encouraged to do so by other means. All written content is for informational purposes only and may not constitute a complete description of available investment services or performance. Neither the information nor any opinion expressed on this Site constitutes an offer by Cogent Strategic Wealth to buy or sell any securities or financial instruments, or to provide any investment advice or service. The services, securities and financial instruments described on this Site may not be available to or suitable for you, and not all strategies are appropriate at all times. The value and income of any of the securities or financial instruments mentioned on this Site can fall as well as rise, and an investor may get back less than he or she invested. Foreign-currency denominated securities and financial instruments are subject to fluctuations in exchange rates that could have a positive or adverse effect on the value, price or income of such securities and financial instruments. Clients should consult their advisor with regard to any questions they may have. Nothing on this web site should imply that past results are an indication of future performance. Past performance is not necessarily a guide to future performance. Independent advice should be sought in all cases. This Site may contain links to other websites, including links to the websites of companies that provide related information, products and services. Such external Internet addresses contain information created, published, maintained, or otherwise posted by institutions or organizations independent of Cogent Strategic Wealth. These links are solely for the convenience of visitors to this Site, and the inclusion of such links does not necessarily imply an affiliation, sponsorship or endorsement. Cogent Strategic Wealth does not endorse, approve, certify, or control these external Internet addresses and does not guarantee or assume responsibility for the accuracy, completeness, efficacy, timeliness, or correct sequencing of information located at such addresses. Use of any information obtained from such addresses is voluntary, and reliance on it should only be undertaken after an independent review of its accuracy, completeness, efficacy, and timeliness. Reference therein to any specific commercial product, process, or service by trade name, trademark, service mark, manufacturer, or otherwise does not constitute or imply endorsement, recommendation, or favoring by Cogent Strategic Wealth. We ask that you notify us in advance of your intention to link to this Site by contacting us at info@thecogentadvisor.com. You may not (i) display this Site in frames, or (ii) display any of the content found on this Site via inline links, without express written permission from an authorized representative of Cogent Strategic Wealth. THIS SITE IS PROVIDED ON AN "AS IS" AND "AS AVAILABLE" BASIS. COGENT STRATEGIC WEALTH MAKES NO REPRESENTATIONS OR WARRANTIES OF ANY KIND, WHETHER EXPRESS, IMPLIED, OR STATUTORY, REGARDING YOUR ACCESS TO OR USE OF THIS SITE, OR THE PRODUCTS, SERVICES OR INFORMATION DESCRIBED ON OR AVAILABLE THROUGH THIS SITE. WITHOUT LIMITING THE FOREGOING, WE EXPRESSLY DISCLAIM ANY AND ALL REPRESENTATIONS AND WARRANTIES OF ACCURACY, COMPLETENESS, TIMELINESS, MERCHANTABILITY, FITNESS FOR A PARTICULAR PURPOSE, TITLE, AND NON-INFRINGEMENT OF THIRD-PARTY RIGHTS. THIS SITE INCLUDES FACTS, VIEWS AND OPINIONS OF INDIVIDUALS AND ORGANIZATIONS DEEMED OF INTEREST. NOTHING CONTAINED ON THIS SITE SHALL BE CONSTRUED AS AN ENDORSEMENT OF THESE VIEWS OR OPINIONS.